The world is constantly sending us signals and commands–do this, follow that, buy a certain product, it will make you happy. That of course is just the nature of advertising. In fact, I can remember TV commercials from years ago, when I was a child–we all can, that’s just how powerful media images are. Occult images in the media are nothing new, rock and roll musicians and others were using occult images 30 or 40 years ago. But back then the images were a little more subtle, but not all of course. But now the occult images of the Illuminati and other secret societies are not so subtle. Indeed, these days the images and the messages they convey are blatant and fully exposed for all to see. We are being conditioned by these messages to embrace the occult. The music and high fashion industries have fully embraced occult images–blatant in your face Satanism, and sadistic and perverted images are everywhere. Our culture has embraced the images of the coming Beast. The recent Super Bowl half-time show starring Katy Perry is an example of the type of imagery I am talking about. I did not watch the Super Bowl, I am really not much of a football fan. 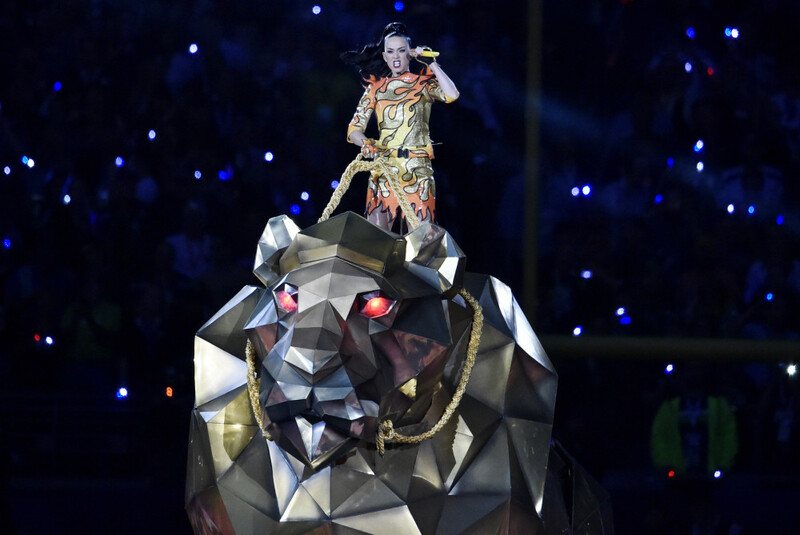 So a few days later when I was scanning the news I ran across this image of Katy Perry riding what looks like a giant mechanical lion; and the first thought that entered my mind was the verse in Revelation of the woman who rides the beast. So he carried me away in the spirit into the wilderness: and I saw a woman sit upon a scarlet coloured beast, full of names of blasphemy, having seven heads and ten horns. And the woman was arrayed in purple and scarlet colour, and decked with gold and precious stones and pearls, having a golden cup in her hand full of abominations and filthiness of her fornication: And upon her forehead was a name written, MYSTERY, BABYLON THE GREAT, THE MOTHER OF HARLOTS AND ABOMINATIONS OF THE EARTH (Revelation 17:4-6). It is my opinion that the message that is being sent to America and the world is that the Beast System is either coming soon, or else it is already here. We are currently living in a world system that embraces Satanism at various levels. Pop culture, and those who promote it, are very good students of occult symbolism. Images such as these are used to great advantage and subtly embedded in the mind; in the future the Antichrist and the False Prophet will also use occult symbolism to manipulate the human mind–the Bible calls it the Image of the Beast. In my book, Alien Antichrist, I describe in great detail what the image is and how it will be used to capture the soul. Once the Image of the Beast is received there is no escape; and those who choose to accept the Image will worship the Beast and fully embrace the satanic Beast system. The song continues with: O be careful little ears what you hear; O be careful little hands what you do;O be careful little feet where you go;O be careful little mouth what you say. The Bible reveals that in the future there is coming a one world satanic system that will engulf the world, and capture almost everyone on planet Earth through an occult initiation called the Image of the Beast–its nothing short of satanic mind control. Pop culture is thoroughly saturated with it. It works 24 hours a day through the media–TV, radio, newspapers, magazines, the Internet. Now that does not mean we hide our heads in the sand, or turn off all media–there are many good things out there too. It just means that we choose wisely what we see and hear. I will set no wicked thing before mine eyes: I hate the work of them that turn aside; it shall not cleave to me (Psalms 101:3). The only source of protection we have against the Image of the Beast, and the Beast system is the Lord Jesus Christ, and the power of His Holy Spirit. Seek the one who died to save us from sin and death. Jesus is the way, the truth, and the life–no one comes to the Father but through Him (John 14:6). If you would like to learn more about the occult symbolism used by the media empire of the Beast then I recommend the following website. Please note though, that I do not endorse everything on this site. You nailed it out of the ball park. Thanks Christopher! I appreciate your comments!